This sports image of a boxer was a commissioned painting from a woman who’s boyfriend is a fighter. Have you thought about having a sports portrait of your partner, your children or yourself? Just contact me at JohnRoberetsonSportsArt@gmail.com. Prices start at $250.00 for a small painting. 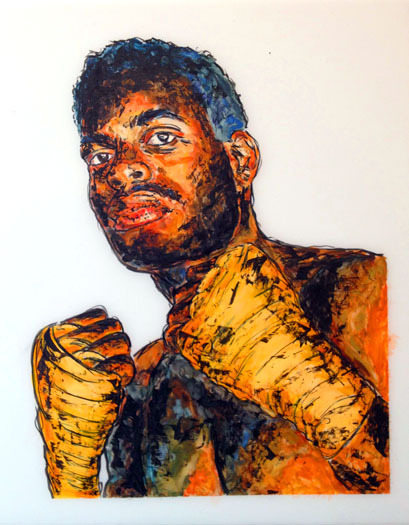 This sports painting of the boxer portrait shown above is approximately 12” x 15” on 14” x 17” drafting film. Ink, watercolor and acrylic.